I had a basic idea, a bit of percussion using some trash cans but that was pretty much it. Fortunately, it was so much more. Last night I attended the opening night for Stomp in Sydney which has a limited run at Theatre Royal (super close to Westfield). The show's premise is using conventional items such as brooms, trash cans, lighters (YES! ), trolleys and a whole lot more and turn them into unconventional instruments. There are 8 cast members in total who 'star' in Stomp which is pretty much the most unglamorous show to star in as they REALLY work up a sweat as well as having to use their 'instruments' to not only make noise but to make a mess (fancy a bit of dust?) as well as creatively clean up the mess on stage (I didn't spot a stage hand doing it!). As cliche as it sounds, the cast is a well-oiled machine. This is one of those shows, where if a member gets their timing wrong, the audience WILL notice. It is very difficult to cover up or ad lib mistakes, especially during some tight numbers. There is barely any verbal interaction so they rely more on body language with the audience as well as each other. 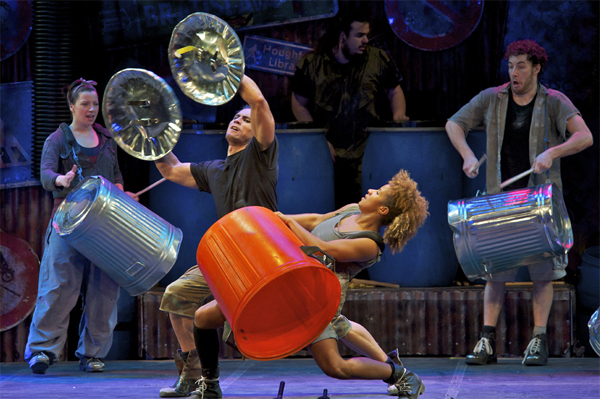 What I loved about the cast, is that they look pretty damn normal and not "Hollywood" which works perfectly for Stomp. Now I'm assuming the 8 cast members have equal billing, but there were a few 'characters' that stood out. Like a boy band there were a few stereotypes, there was the hottie, cutie, bad boy, the one you can't really put into a box and the fatty. The latter sounds really harsh, but it was a key part of his character and I'm assuming that's why he was hired. There were 2 ladies in the cast, and I was a bit disappointed they didn't really have a 'character' themselves. Fortunately, they did not go into the female stereotype, they had just as much energy and ferocity as the men if not more. What was an unexpected surprise, was that it was actually quite funny! 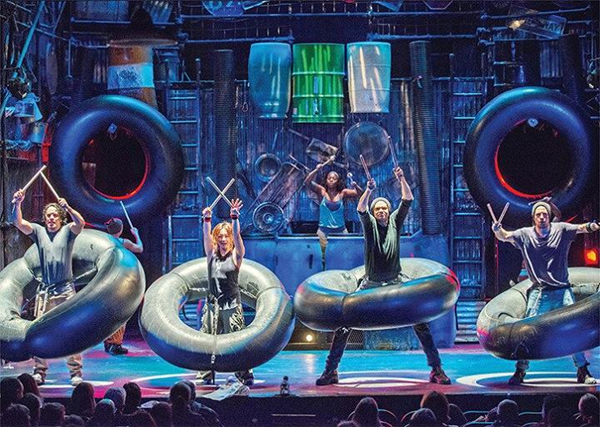 I actually didn't associate comedy with Stomp until I saw the show which displays how culturally ignorant I am. The show's highlights were the moments of physical comedy and audience interaction, and yes it worked. Now where do you want to sit? This show has a lot of interaction, but instead of picking on individuals, everyone gets involved. So have no fear about sitting at the front! I studied music throughout School and there were some elements of the show that reminded me of that experience. If you hate clapping... get out! I was in the second row, the major pro is that you get to see the footwork and the elements really close. BUT since the first few rows aren't elevated, it's a bit of a lottery trying to not have a badly obstructed view (I'm 5 feet short) fortunately that wasn't the case last night. The other potential downside is at times it gets really LOUD! At times it reminded me of Chinese New Year with the Dragon Dance. And there might be a possibility of getting splashed... you have been warned. Overall, I really enjoyed the show, I was wow'ed with the use of objects as instruments, the high energy of the cast, and the fact the show didn't take itself too seriously. Since percussion is the core element of the show, if you don't think you would find this interesting I would assume this show is not for you. At time of writing, the last show is on 15th September (this Sunday!) subject to be extended, if you're interested there is a very short window to see the show in Sydney. You can book tickets here. NOTE: The images were not taken by me. The cast in Sydney differs from the images shown. I attended Stomp as a media guest.